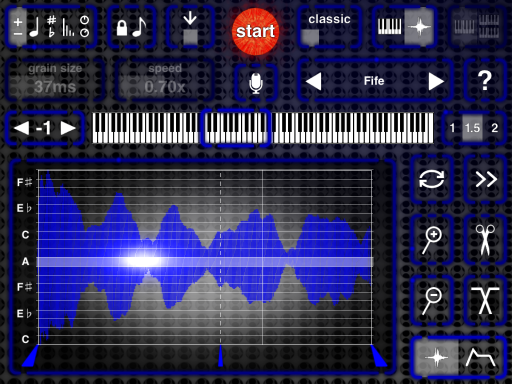 Wizdom Music has finally taken this (Including GeoSynth, and MorphWiz) fantastic app to the next level. Audiobus support is here! No more fussing with the time limited recording function. Sorry if you liked that. It’s definitely a very welcome update to a great app that has suffered in many iOS users dust folders of non-Audiobus supported apps. So get to it! Sampling and re-sampling is easier than ever. SampleWiz has just seen a nice update that brings us MIDI support, 12 new cool presets. Also added to Sample Wiz in this update is support for AirTurn Pedal to change presets, and function to disable animation, and finger vibrato. Review prior to this update follows. OK, corny title, I couldn’t resist. Jordan Rudess of Wizdom Music brings us a new, fascinating and fun sampler in SampleWiz. This review is based on use with iPad 1. But it is also compatible with 3rd generation iPod and up. Right away you’ll notice a colorful and simple interface that is very strait forward and easy to understand. The design looks cool with some unique visualizations, depending on what you are doing. It lights up under your fingers both literally and figuratively providing a very smooth work flow not to mention looking great. If you are familiar with Wizdoms MorphWiz you will see right away that this was designed with ease of use in mind. Customers asked for less complexity, and they got it. SampleWiz looks easy but is also quite elegant. Makes sense. It works fine as is. Sounds great to me. I would however like a little more than 10 seconds. Still, this is nothing to be overly concerned with. The playing surface isn’t limited to just a keyboard. There’s 3 playing surfaces in all. In addition to the keyboard (which is adjustable) you can further express you creative juices using the Wave Edit screen, and or the ADSR window. The sampler has three modes. Classic sampling which is the common method where samples speed up or slow down as you play over or under the samples original pitch. Granular mode is fun, with adjustable grain size and speed. You can twist up and granulate your samples to your hearts content. The notes retain the speed they were recorded in. Last is Modern Mode. A new way to explore sampling using “Dirac” technology, this automatically adjusts time and formant over a selected range. For a full list of specs check out SampleWiz in the iTunes app store. You will find lots of control over your samples from playing to editing. All the features you expect like trimming, cropping, standard looping, forward or reverse, ping pong (plays forward and reverse in loop). Adjusting and selecting a wide range of scales, BPM selection and lots more. You can have one or two keyboards, and if you choose two both can be set to have it’s own different scale and range of your choosing. Hold, is a neat feature that allows you to select and hold notes just as it says, and the held notes can have a different synthesis mode. This is very nice allowing even more expression and avenues to explore samples and new possibilities. SampleWiz sounds very nice. I didn’t notice any compromise is audio quality during hours of use with all the various settings. As far as FX go there is a solid delay. Really SampleWiz is a big FX unit in a way. I would like to see some more FX. Adding Reverb, would be great. Some users were experiencing low memory problems causing their first generation iPads to crash. I didnt experience any crashes myself but they already updated that with a fix. Nice to see such speedy action with a solution. All in all if you’re looking for a nice, highly capable sampler with lots of possibilities to create unique sounds, instruments, or just have a grand time. SampleWiz delivers. It has appeal to pros and newbies as well. The ever important sharing capabilities are here with MAPI copy paste,(with compatible apps) and iTunes file share, both allow you to bring in (or out) new samples of your own and use them just as well as the presets. 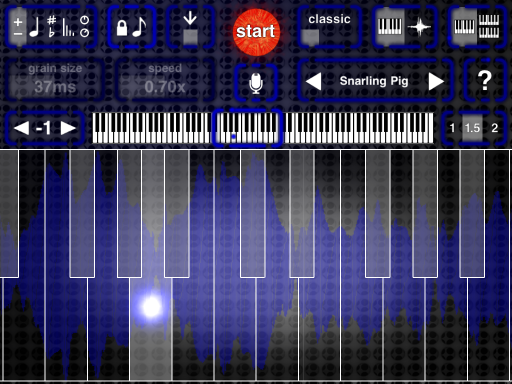 SampleWiz looks great, sounds great, and is loads of fun. At $9.99 US, it’s a good buy for all. PS Occasionally I get various promo codes, so stay tuned. I’m all out of SampleWiz codes for now. Nice review, all I have to say is that J.R has the best ideas for music creation and I hope he continues with this awesome work! Great review. Looking forward to using this app. How can you record your performance using Logic on Mac? Also how do you hook it up to use as live performance instrument? I agree this is another great review by a great guy! I would like to add though,being an iOS iPad only musician I would be great to have a global record option to use the stuff I mangle in Samplewiz in other iOS projects. Se la vi. I guess I will have to dig out the USB interface and jack into my laptop ;). Oh yeahhttp://www.idesignsound.com/twistedwave-audio-editor/Just incase you guys are looking for a similar minded iOS musician!